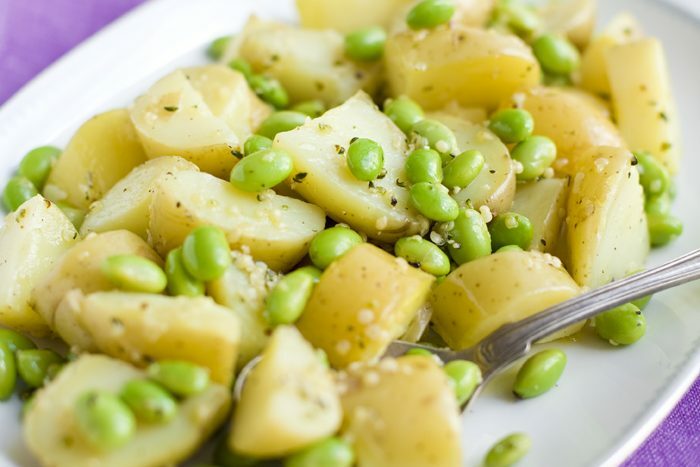 Say hello to your salad’s new best friend. This jar of mustardy granola has become a total game-changer in our kitchen. And if you are like us and often mix leftovers into quick salad bowls, you are soon going to realize its potential. The granola has the most delicious flavour and adds a superb crunch to all types of salads. 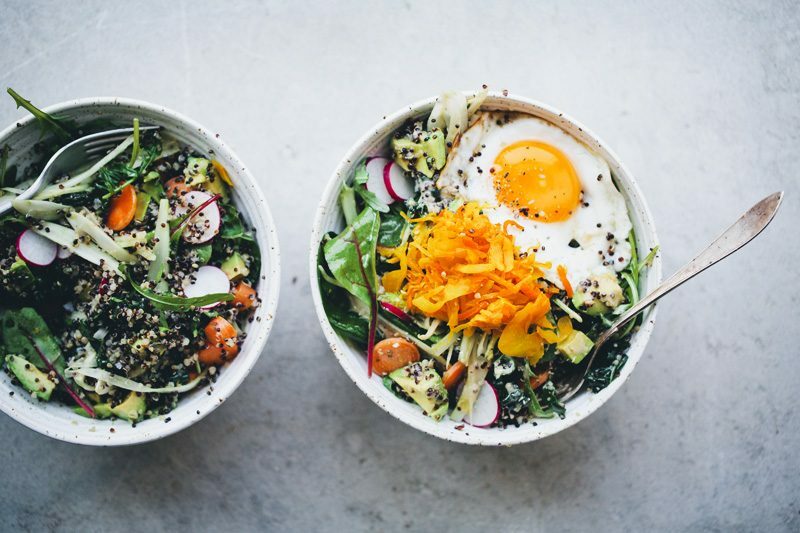 We don’t see this as a salad topping but instead a filler that you can use instead of cooking a batch of rice, quinoa or millet or whatever you normally use to make something simple and green into a more substantial meal. The granola is also great with soups (perfect for gazpacho!) and on top of grilled feta cheese or on a savory yogurt bowl. There are doubtless lots of other uses that we haven’t tried yet, but we surely will during the summer. 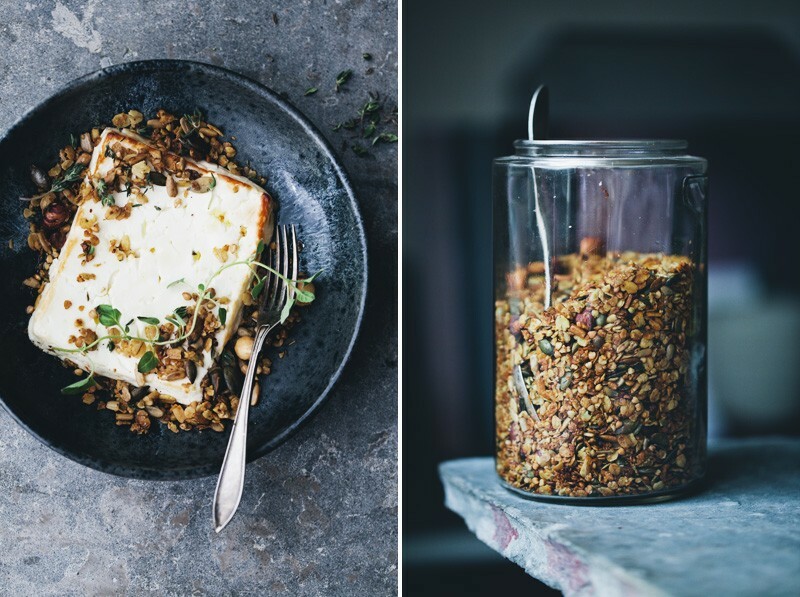 To help you get started, we are also sharing a quick little baked feta cheese recipe and a crunchy green salad which both are optimal paired with the granola. The feta cheese is almost too simple. Bake a block of feta cheese for 10 minutes on 200°C / 400°F, then switch up the temperature to max and turn on the broiler for just a few minutes. 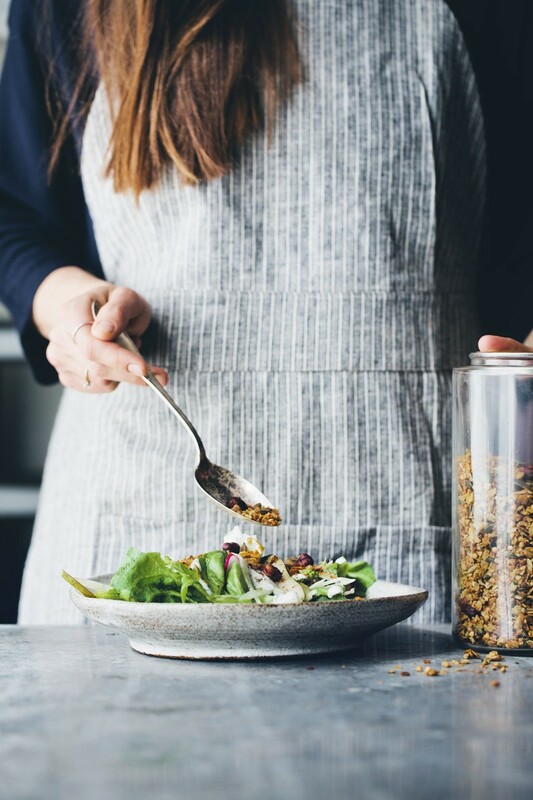 Drizzle with olive oil, fresh herbs and a generous sprinkle of savoury granola. We usually serve the cheese as a side dish to share on the table. An extra drizzle of honey will make it even more special. The salad is a bit of a mash-up between a salad and a slaw. 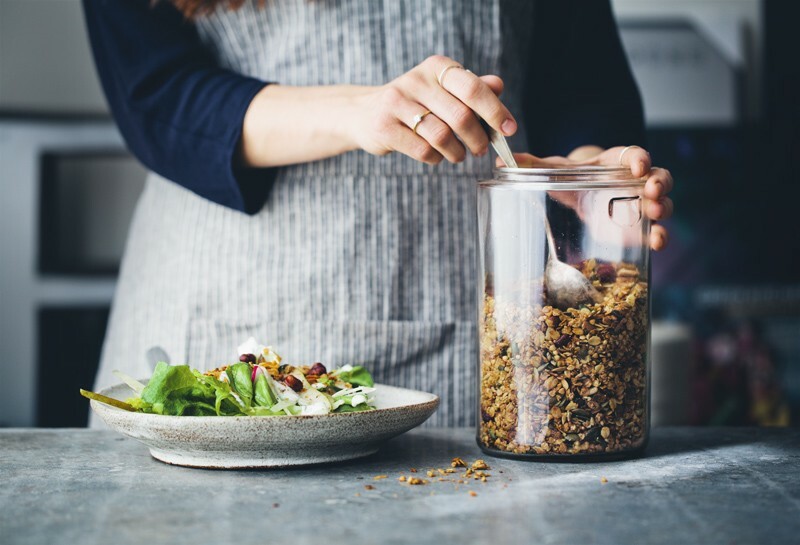 Thinly sliced vegetables and pears are mixed with lettuce, drizzled with a yogurt dressing and then covered in granola. Win! You can of course add or replace any of the seeds, nuts or flakes with what you have in your pantry. If you are looking for a slightly lighter granola you can replace some of the oil with water. Dry spices could also be added instead of the fresh herbs. Preheat the oven to 180°C / 360°F. 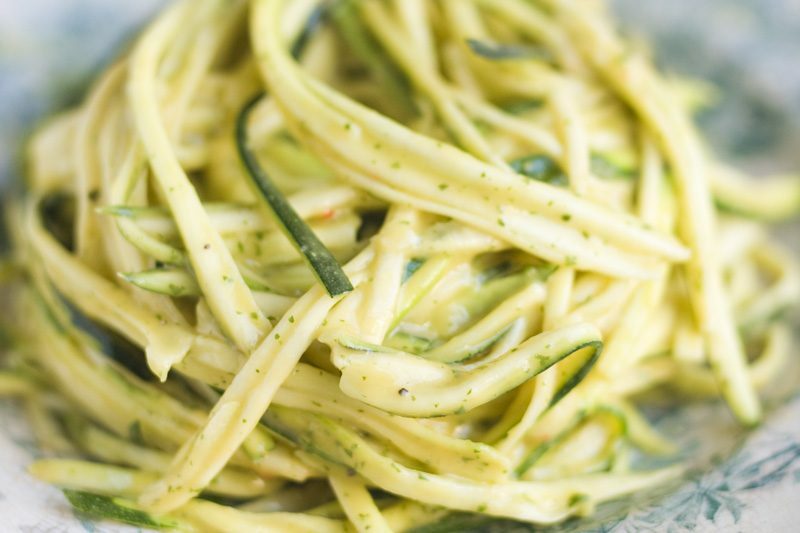 Combine all of the dressing ingredients in a large bowl and whisk until smooth. Add all of the dry ingredients to the bowl. Use you hands or a spatula to toss the dry ingredients in the dressing until all is coated. Bake for about 20 minutes or until crunchy and golden, stirring the granola halfway through to prevent it from burning. We usually add some extra herbs after it is baked but this is of course optional. Store in an air-tight jar in room temperature for up to 4 weeks. Prepare all the salad ingredients and place them in a large salad bowl. It’s easiest to use a mandolin to get thin slices. Drizzle with olive oil and toss to combine. 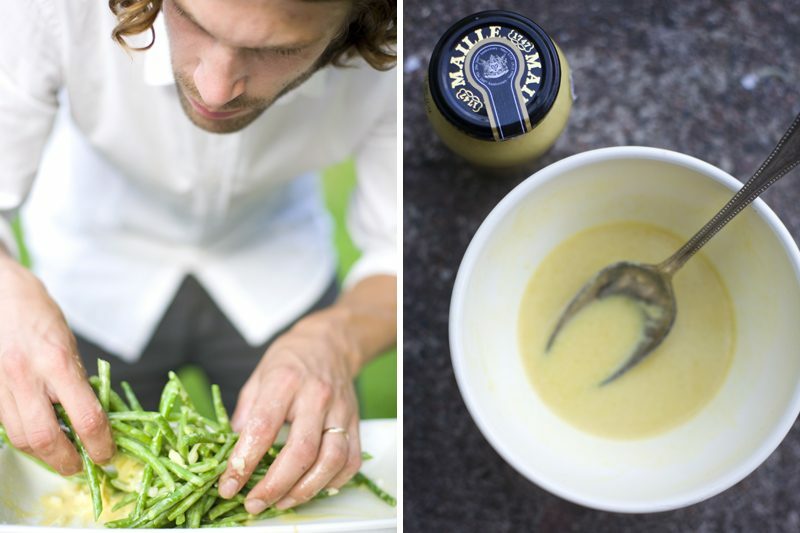 Stir together the yogurt dressing in a small bowl. 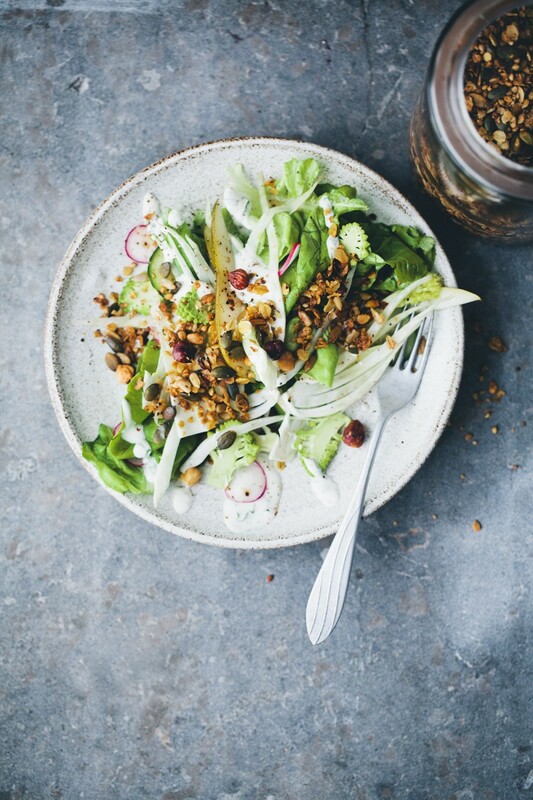 Serve the salad on 4 plates, drizzle with yogurt and top with a generous scoop of granola. PS. In case anyone is wondering, the salad plate was a real bargain from a local ceramicist. Apparently it’s a bit uneven so we almost got it for free. A tip is to always ask for their “damaged goods” if you want unique pieces and are on a budget. The apron is from Stone Cold Fox. Hi! I made the receipe and at first I was sceptical about salted granola, but since I had everything on hands I thought I could give it a try. It is just delicious on salad! 😀 Happy I tried! Nice pics too! Qué manera tan espectacular de comenzar la semana!! Siempre me sorprenden! Gracias! looking good, luise! Thank you guys so much!!! I haven't had feta warm in SO long. Forgot how delicious it is. Hi Susanna, you can use any oil you prefer. And, yes, you can replace the rye flakes with the same amount rolled oats. This is great guys, as always! I've never tried baked feta, I wonder if it will work well with 0 fat feta as well. The savory granola is definitely something I'll be making! Always delightful to get a new recipe from GKS! One question: Are the buckwheat groats added uncooked? Thanks! Thank you for posting a savory granola!! I just discovered the notion a few weeks ago when I found a recipe for one made with tahini, miso, lemon, and nori. I've gone wild with the idea. 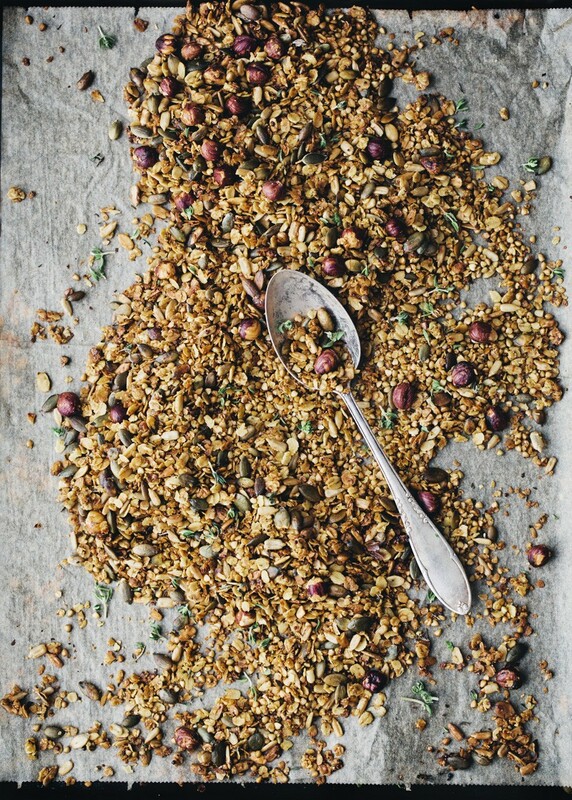 tahini, miso, lemon and nori are all things i love - would you share the recipe for the savory granola you mentioned? thank you! You guys are genius!this sounds amazingly good! This is super interesting! I think this would be great on a soup, salad or even yogurt parfait! I would love to try it out as well! Yes, a yogurt parfait would be an awesome pairing! Oh, I bet this would be great as a garnish to a creamy soup as well. I can't wait to try this and the baked feta. What a game changer!! This is so unique and delicious sounding! Definitly trying the granola, I really love buckwheat. I was just staring at that bowl, thinking it was crooked and wondering if it was a trick of the light. I'm a ceramicist and it was driving me crazy! This granola recipe is wonderful, thank you!